Vacation Rental House in Vineyard Haven! I recently mentioned to Matt that I think the idea of fog on the Atlantic coast of Nova Scotia was a hoax, a big conspiracy to keep this wonderful cruising ground all to themselves and the brave few who decided to venture up despite warnings. 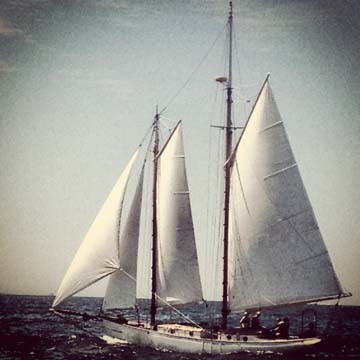 Welcome to our website & blog about living on and caring for an old wooden schooner, Heart’s Desire. We hope to share what we’ve learned through this lifestyle and hope you’ll follow along on our adventures. © M.Hobart and J.Drysdale (sailheartsdesire.com), 2014. Unauthorized use and/or duplication of this material without express and written permission from this blog’s author and/or owner is prohibited. Links may be used, provided that full and clear credit is given to sailheartsdesire.com with appropriate and specific direction to the original content. Please feel free to contact us if you would like to use our content!